Bay Splash events are smaller events throughout the year where we partner with other community organizations to raise awareness of our mission. These events are often outdoor events designed to connect more citizens to our natural resources. Many times, an organization approaches us and offers to host an event and donate a portion of proceeds to support our work for clean water, clean air, and healthy communities. We are very grateful to have such valuable partnerships in our community! Are you interested in collaborating with us on a Bay Splash event? For more information, please contact Development Director Justine Herlihy at jherlihy@mobilebaykeeper.org or call 251-433-4229. Join us at Dority's on Dauphin Island for an afternoon of art with metal sculpter Frank Ledbetter, live music by Brandon Coleman from The Red Clay Strays, and delicious food. The event will conclude with a giveaway of Frank Ledbetter's Red Snapper sculpture, which will be the first of a series of pieces to be benefit Mobile Baykeeper. Tickets are $10 and will support Mobile Baykeeper's efforts for clean water, clean air, and healthy communities. For more information, please contact Justine Herlihy at jherlihy@mobilebaykeeper.org. We partnered with Fairhope Brewing to launch the "Hop in the Bay" IPA in Summer 2018. This easy-drinking, seasonal IPA is served in several local bars and restaurants throughout the summer and a portion of proceeds benefit our work for clean water. The Big Float is a paddling event held in conjunction with SweetWater Brewing in conjunction with SweetWater's "Save Our Water Campaign". The purpose of this event is to connect more community members to our beautiful natural resources. In 2016, the event consisted of a two-hour guided paddle with WildNative Delta Safaris from Bluegill Restaurant to Whiskey Ditch. Following the paddle, we enjoyed lawn games, live music, and drink specials. This year, the event will take place on Saturday, August 18, 2018 from 10 a.m. to 12 p.m. on Fly Creek. Stay tuned for more details to come! 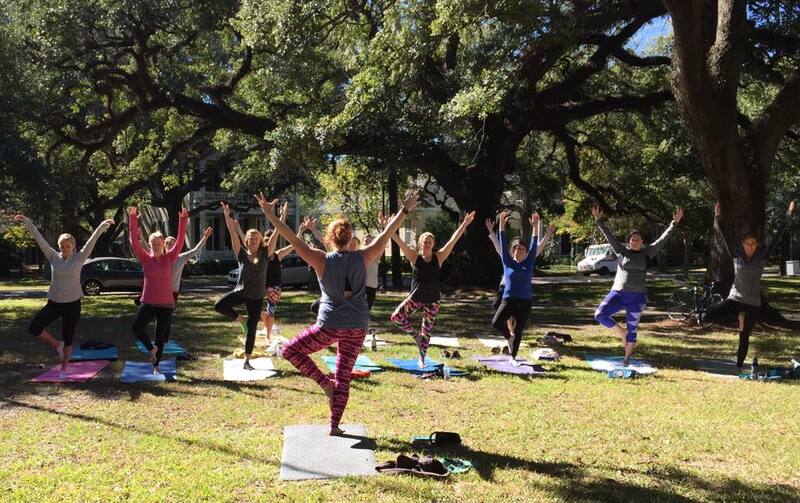 During our 20th anniversary in 2017, local yoga instructor and Baykeeper member Alison Herlihy is hosting "Yoga in the Park", a monthly yoga class in various parks throughout Mobile and Baldwin Counties to benefit Mobile Baykeeper. Cost to attend is $10. Stay tuned for announcements on next month's class! Our friends from Mobtown Merch are donating a portion of all proceeds from their "Defend the Delta" T-shirts to support our work protecting the Mobile-Tensaw Delta and other area waterways in the Mobile Bay Watershed. Buy your shirt here today! In 2015 and 2016, we partnered with our friends from Wintzell's Oyster House, Good People Brewing, and Gulf Distributing Company to organize a shrimp-eating contest with teams from Wintzell's, Mobile Baykeeper, and other local businesses to benefit our mission. You can't have great seafood without clean water! We kicked off our 20th anniversary in style with Art of the Bay at the Mobile Arts Council. This event featured a local art exhibit highlighting the beauty of Mobile Bay, wine, appetizers, and the unveiling of our 20th anniversary magazine. 2017 marked the second year we assisted volunteering at the Flora Bama Gulf Coast Paddle Championships. The event is a paddle boarding tournament on Ole River in Orange Beach hosted by Gulf Coast Paddle Company and we received a portion of proceeds from the event. This year, our friends from SweetWater Brewing and Gulf Distributing Company supported us through a "Tap Takeover" at Old 27 Grill, where a portion of proceeds from beer, raffle items, and dunk booth tickets supported our mission. In 2017, Whole Foods Market Mobile selected Mobile Baykeeper as the recipient of its 5% Community Giving Program. On this particular day, 5% of net sales from Whole Foods Mobile directly benefitted our efforts for clean water, clean air, and healthy communities. It was a great turnout and we were honored to be a part of such a wonderful giving program. Are you interested in supporting our work through a Bay Splash event? Contact Development Director Justine Herlihy at jherlihy@mobilebaykeeper.org or call 251-433-4229.